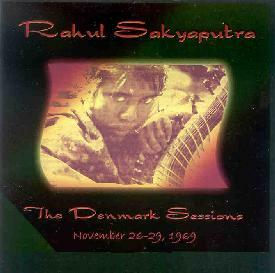 Rahul Sakyaputra - "The Denmark Sessions: November 26-29, 1969"
This CD was released to commerate the 30th Anniversary of Rahul's first concert in the West, recorded in Århus, Denmark in 1969. Rahul trained under Baba Alla Uddin Khan, the same man who trained Ravi Shankar. The music on this CD is split into 3 pieces, two Raga's recorded in 1969 and a new piece which you can barely hear in the background as Rahul describes everything leading up to his playing in Denmark in 1969. The recording is quite good but still a little dated by today's hi-fi standards. The pieces are long meditative ragas (22 and 12 minutes) and very traditional sounding. If you like classical Indian sitar music, you can not go wrong. For more information you can visit the Zemira web site at: http://www.zemira.com/. You'll find loads of music at Rahul's Mp3.com web site at: http://www.mp3.com/RahulSakyaputra. Contact via snail mail c/o Zemira; PO Box 41162; Long Beach, CA 90853.